Friday – Spent the entire morning into the afternoon in bed watching TV and surfing online. Did absolutely nothing productive and didn’t feel too guilty about it (maybe just a little). Saturday – Made a big breakfast, watched TV, went to Dominick’s to see what was left on the shelves (since they are closing all their stores at the end of the year) and purchased 3 cartons of lactose free milk, among other things, for under $1.50 each, got a delicious Lou Malnati’s deep dish pizza (as well as a $100 gift card to fund 2014’s pizza cravings since a free $25 gift certificate came with it), rented Red 2 from Redbox (ok, but not as good as the first one), and watched the first three episodes of Firefly (we borrowed the complete series from the library). 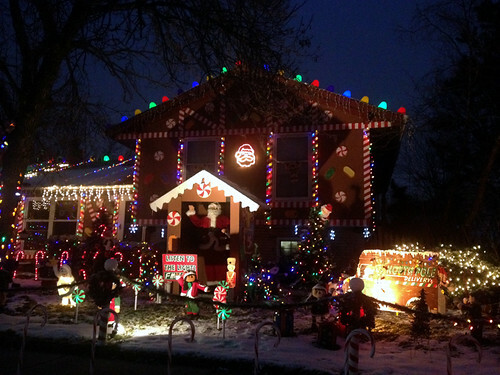 Sunday – Watched more episodes of Firefly and in the evening, with hot chocolate in hand, toured the neighborhood looking at Christmas decorations, like the house pictured below. Monday – Attended my company’s Christmas luncheon at a local steakhouse and had a nice time (four hours just flew by). Said goodbye to Winston. Watched more Firefly. Tuesday (Christmas Eve) – Baked an awesome chocolate pecan pie and made Oreo cookie balls, both of which were taken to my parents’ house to celebrate Christmas Eve. E was with us and we did our annual Crazy BINGO even though it was more like Crazy UNO. Joe ended up winning the “big” prize of $20. Also, one of my gag gifts, a gingerbread picture frame ornament containing a photo of poop was a big hit with Brother # 1. He ended up buying it off E for $3. We also surprised my parents with a new large widescreen monitor for their computer so they can read their emails better. We stayed until just after 11 pm and finally got home and to bed after 1 am. Today (Christmas) – Decided to go see a movie instead of sitting around the house and feeling let down about the holiday since we had exchanged gifts on Tuesday. We chose Anchorman 2. We chose poorly. It was one of the worst movies we’ve seen in a very long time. There was hardly any funny scenes and it was just a major disappointment. I cannot believe it has a 75% positive rating online. It should have never been made. Came home, ate Chinese food for lunch, which we ordered and picked up yesterday since, despite everyone’s belief that Chinese restaurants are open on Christmas, none of the ones in the area I called yesterday were planning on being open. Finished watching Firefly. A few friends are in love with this series, and while I did enjoy it, I didn’t think it was all that. It was rather weird how other than the whole spaceship stuff it was mostly like a western. That being said, I do plan on getting my hands on the follow-up movie, Serenity, soon. Presents – This year we gave each other a budget of $100 for gifts. I got Joe some running gloves and a hat, socks (albeit the wrong kind because I’m a moron), some coffee syrup, weights, a guitar tab book, and Rocksmith 2014 for the PS3. He gave me some Cuddl Duds (long underwear), a collapsible multi-disc light reflector, a wireless bluetooth speaker (the sound is quite impressive), and some nail polish I’ve been wanting. We also bought each other candy stocking stuffers like we do every year. I feel conflicted about going back to work tomorrow. On one hand I’m getting rather bored being at home, but that doesn’t necessarily mean I enjoy working. At least it’s only two days this week. I normally have Fridays off but figured I’d go in so I’ll get paid for four days but only have to work two.